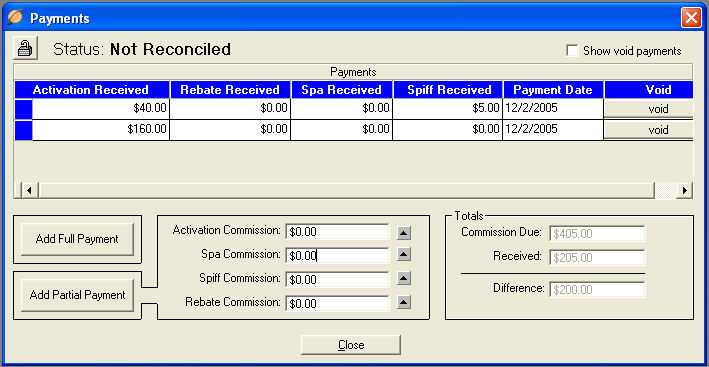 Within the Payments window you can have one or many payments for an activation. Each amount will be detailed with payment amounts and will have the option to Void each payment line item. Add Full Payment : Click this button to add a full commission payment. A new line item will be created within the payment transaction viewer. A Full Payment Amount could be the entire commission amount due, or the difference between received commissions and the commission due. Add Partial Payment : Click this button to specify specific partial payment amounts for each of the respective commissions. A new line item will be created within the payment transaction viewer. button. This will bring you back to the Transaction Window. Continue to make additional payments or adjustments as needed. button on the Transaction Window. Payments and Reconciliations will be presented in the Receivable Commissions Report.